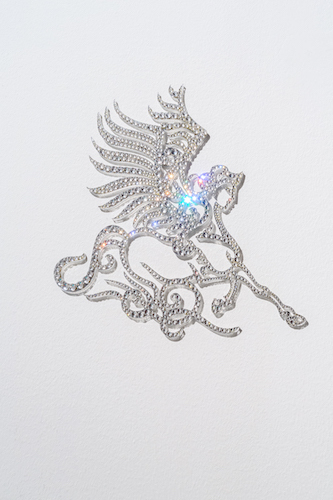 Raja’a Khalid, Buraq, 2016, custom-made Swarovski crystal car decal, acrylic, 10 x 10". A sharp intimacy suffuses Dubai-based Pakistani artist Raja’a Khalid’s show like the warmth of late afternoon sunlight. Reflections bounce off the iridescent automotive-paint-coated panels of High Noon (all works 2016), where tangerine gives way to deep orange, and Santa Barbara, which itself is seafoam but casts onto the floor a lurid green. Perhaps donning the US military-issue Oakleys set on a dune-textured altar of a shelf in sun and sand worship, or the bomber jacket, Solaro, would shield one from the light. Made from the titular suiting fabric, the latter’s underside is shot through with red, which colonialists believed would protect their pale skins from harsh tropical rays. Two photographs of a bonding ritual that happens here each summer lie at the heart of the exhibition. When falcons begin to molt, they are blindfolded, leashed, and placed in a protective tent. After a week or so, they are untethered; after another, their hoods are removed and they see each other for the first time. The acculturation process is designed to slowly build trust and feels like a mirror of Dubai’s complex demographics, where only twelve to eight percent of residents are citizens. Local references abound in Tom Ford Oud Wood, an industrial diffuser spewing out the sultry musk of the perfume, and in the plasticized Palm Leaves that are the primary flora of shopping malls, as well as in the diamanté car decal Buraq, which shows a winged horse with the face of a woman from Islamic mythology. Yet Khalid reaches beyond the easy seduction of Gulf imagery to tap into the region’s underlying economy. The UAE’s failed transmutation of Sun Ra’s Afrofuturism into Pan-Arabism and the emotional textures of never belonging are captured here, like a single drop of sweat trickling to a stop halfway down your face.